Lack of resources can create drains on time, leaving financial aid administrators less time to counsel students and families on the ins and outs of the financial aid process. The results... show that across the board financial aid professionals continue to face heavy workloads and their offices continue to be understaffed, often to the detriment of students. In an ongoing effort to keep tabs on how financial aid offices across the country compare on a number of factors–including staff size, salary, administrative capability, inter-campus relations, and more–the National Association of Student Financial Aid Administrators (NASFAA) conducted a two-part benchmarking survey of institutional members, examining both staffing and salary. The results, as detailed in a report released today to NASFAA members, show progress in certain areas, but also show that across the board financial aid professionals continue to face heavy workloads and their offices continue to be understaffed, often to the detriment of students. 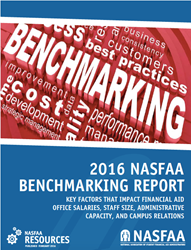 NASFAA has conducted benchmarking surveys of financial aid administrators and offices for more than two decades. This new 2016 report presents findings on survey data collected from NASFAA members in 2015 and updates research from 1995, 1999, 2006, and 2012. Greater regulatory compliance requirements result in resource shortages. Nearly all schools that responded to the survey cited a greater compliance workload as major factor contributing to resource shortages. In 2012, 83 percent of responders reported they had time to do “more” or “significantly more” than what is required by Department of Education regulations, but in 2015 that dropped to 63 percent, indicating that more financial aid administrators than ever before feel they only have time to do the bare minimum. Offices are understaffed. The average school has 11 full-time employees in the financial aid office, but only 2.8 employees to serve every 1,000 financial aid applicants. According to NASFAA’s 2015 Administrative Burden Survey, two-thirds of schools indicated that constrained resources negatively affected student counseling and outreach. Wages are falling; gender gap is narrowing. The data gathered show the median salary for both genders working in the financial aid office decreased since 2012: male salaries decreased by $4,799 (8%) on average and females decreased by $649 (1%). This closed the salary gap between males and females slightly, with males earning $7,669 (15%) more than females in 2015, as opposed to $11,819 (21%) more in 2012. “One-stop shops” are becoming more popular. One-quarter of all responding schools reported having a “one-stop shop,” or service center that provides combined student services in areas such as financial aid, registration, admissions, and academic advising in order to reduce the number of student visits to multiple campus offices–an increase of 8 percentage points from 2012. “These benchmarking surveys are a tool our members can use to see how they stack up to other similar institutions, but also serve as a reminder for policymakers and college presidents that when financial aid administrators are under-resourced or made to comply with unnecessary administrative requirements, students suffer,” NASFAA President Justin Draeger said. Experts are available for interviews to discuss the key takeaways from this new benchmarking report and what the data means for financial aid offices, students, and policymakers. To request a full copy of the 2016 NASFAA Benchmarking Report or to schedule an interview with a NASFAA expert, members of the media can contact us at 202-785-6959 or news@nasfaa.org.